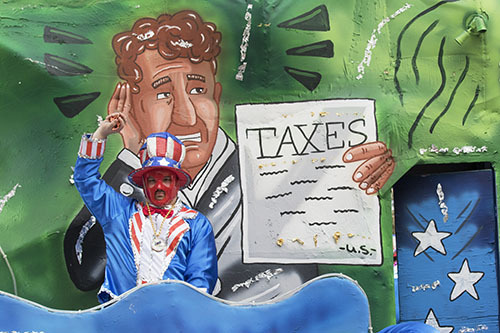 Although New Orleanians may be focused on Carnival season in the coming months, we can’t forget it’s also tax season. If you have difficulty seeing your way through all the forms and instructions, there’s help. The federal Volunteer Income Tax Assistance is offering guidance to taxpayers. In a kickoff to tax season on Saturday, Feb. 2, Entergy New Orleans is partnering with United Way of Southeast Louisiana and Total Community Action to provide free tax preparation for the annual Super Tax Day. This year’s event takes place at the Xavier University Convocation Center, 7910 Stroelitz St., from 9 a.m. until 3 p.m. where trained volunteers will be on hand. One focus of the event is to help qualified New Orleanians claim the federal Earned Income Tax Credit. This tax credit is designed to help lift Americans in need out of poverty. Entergy has helped approximately 127,000 customers in its four-state service area receive some $224 million through the EITC program since 2011, the utility reports. And as part of that, more than 20,000 qualified New Orleanians have received more than $38 million over the past eight tax seasons. During Super Tax Day, residents who agree to save part of their total refund at the event will have an opportunity to win up to $50 in cash through a scratch-off card promotion and will be entered in other drawings through the Save Your Refund program. If you can’t make it to Super Tax Day, individual one-on-one tax assistance is available during tax season at sites throughout the city. The assistance is generally available to taxpayers with an annual income of $55,000 or less, with a disability or with limited English language skills and to taxpayers who are 60 or older. For more information, see the IRS website, IRS Publication 3676-B, or entergy.com/freetaxhelp. VITA volunteers are available at the following Uptown locations. Unless otherwise indicated, these locations are open through April 15. Bring a valid photo ID, income documents including W-2s and 1099s, Social Security cards for everyone claimed, previous tax returns, Health Insurance Marketplace Statement (Form 1095-A), and checking and savings account numbers (canceled or voided check) for direct deposit of refunds. Appointments only, call 504-875-2660. Assistance in Spanish available. From April 15 through Oct. 15, tax help will be available on Tuesdays, 1-4 p.m.
Open Feb. 5 to April 9. Open Feb. 1 to April 16. The AARP Center is part of the Tax Counseling for the Elderly program that offers free tax help to taxpayers who are 60 years of age and older, specializing in questions about pensions and retirement-related issues. Monday, 10:15 a.m.- 2 p.m.
Tuesday, 10:15 a.m.- 2 p.m.
Wednesday, 10:15 a.m.- 2 p.m. Call 504-418-4051 for an appointment. Walk-ins are also accepted every day but Saturday. Call 504-523-6621 for an appointment. Walk-ins also welcome. Monday, 10 a.m.-1 p.m., 2-6 p.m.
Tuesday, 10 a.m.-1 p.m., 2-6 p.m.
Wednesday, 10 a.m.-1 p.m., 2-6 p.m.
Thursday, 10 a.m.-1 p.m., 2-6 p.m.
Friday, 10 a.m.-1 p.m., 2-6 p.m.